Preventing yeast infections naturally requires knowing how to prevent yeast overgrowth. Top ways to prevent infections while on birth control, during pregnancy, or during an illness are done through diet. You first need to prevent an overgrowth called Candida albicans from taking over your body. This is accomplished by filling your body with beneficial bacteria to establish a healthy pH balance. Achieving a healthy pH balance can be possible for most adults. It involves knowing your body and living a lifestyle that inhibits the formation of yeast overgrowth in the body. This can be done in various ways. Because we know some of the reasons why yeast infections come about, we can look toward yeast causes and yeast infection prevention. Some Candida and yeast infection causes that are believed to contribute to yeast infections include eating excess amounts of sugar, overuse of antibiotics, sexual contact, and maintaining a diet full of simple carbohydrates. Another less talked about subject in yeast infection causes involves the body pH balance. When we talk about preventing yeast infections, it's hard to ignore the fact that acid-alkaline properties have a lot to do with it. This is true for the vaginal yeast infection and male yeast infection. Your bodies pH (pH stands for potential of Hydrogen) balance plays a vital role in your overall health. The pH is the measure of hydrogen ions in a substance. The more hydrogen ions a substance has, the more alkaline it is, and the less hydrogen ions a substance attracts, the more acidic. 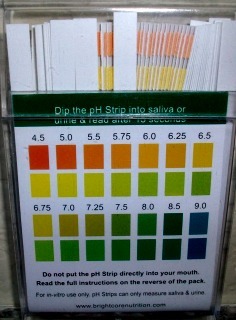 The body at all times is on a mission to keep it's pH balanced, and that means it likes to be kept between 7.35-7.45. When this balance is disturbed, your body will take what is needs from other areas of the body, such as calcium from your bones, to make up for the disturbance. When this happens, your body can become deficient in the minerals it needs to function properly. Measuring pH levels is done on a scale from 0-14. The lowest number on the scale which is 0, would be the most acidic and the highest number on the scale, 14 would be the most alkaline. The number 7, is a neutral number, and is neither acid or alkaline. Over all, the body wants to stay in a slightly alkaline state. Different areas of the body have different pH levels. For instance, your saliva and urine have their own pH levels with saliva being the most variable. Your blood pH level is the most critical and can not fluctuate because going outside the level of 7.365 can cause disease and death. When the body pH declines to a level of 7 and under it's becoming overly acidic, there are certain minerals that work to get the body closer to a more alkaline state. Minerals help maintain an acid-base balance to keep the body pH neutral. Some of those minerals being calcium, phosphorus, and magnesium. But if there are not enough of these minerals available to carry the acid away, your body will deplete itself by taking from other sources and further damaging the liver and kidneys and emptying the acid right back into the blood. A place it doesn't belong! Now, we've created a perfect environment for Candida to thrive. Candida lives in an acidic environment so once the pH level is unbalanced, that sets the stage for Candida overgrowth in turn causing mild symptoms that escalate over time. This is why a balanced pH is so important. Books like The pH Miracle by Robert O. Young, PhD and Shelly Redford Young are great resources to learn more about body pH and preventing yeast infections. You can find out more about Candida on the What is Candida page. So, if you've done a yeast infection test and came to the conclusion that you are overly acidic, there is good news in preventing yeast infections. There is a way to correct a declining pH. The answer usually lies in what you eat. Your diet is a critical factor in changing your pH level. Although a diet change may sound easy, in reality it can be a challenge because the foods you need to avoid are the very foods that Candida albicans craves. Eating foods made up of an alkaline diet can help get the body back in balance and aid in preventing yeast infections. Foods like fresh coconut nutrition, stevia sweetener, asparagus, garlic, lentils, seaweed, lemons, onions, grapefruit, sweet potatoes, pumpkin, berries, and most green vegetables are highly alkaline and would be good additions to a diet that is too acidic. On the other hand, foods such as artificial sweeteners, corn, soft-drinks, white flour, beer, spaghetti, white vinegar, and white rice are highly acidic.